A little egg lay on a leaf.... Pop! Out of the egg came a tiny and very hungry caterpillar. one piece of chocolate cake, one ice cream cone, one pickle, one slice of Swiss cheese, one slice of salami, one lollipop, one piece of cherry pie, one sausage, one cupcake, one slice of watermelon..... and one nice green leaf. He built a small house, called a cocoon, around himself. Here he is with all the food that he ate. The caterpillar is made from a soft green sock with googly eyes glued on it. All food pieces are made from felt and glued together with a hot glue gun and details drawn on with a Sharpie marker. The cocoon is sewn together around the edges. Thanks to my sister for this wonderful idea (which she got from a friend- so, thanks to her friend, as well!). Head over to I Blame my Mother for more Kid Friendly ideas. This is ADORABLE!!! What fun my kids would have with it. I have enough felt - I might try to make one myself. Would be a great birthday present as well...or a teacher gift. Thanks for linking to Kid Friendly Friday. Have a nice weekend! This is so cute...what a great idea!! Emily and her friends LOVE this book. They would really enjoy this puppet to go along with it! I just chanced across your blog through Twitter. What a fantastic craft project. I am planning a 3rd birthday party for my dd2 and already have all the party supplies, but this would be great as entertainment to go along with reading the kids the story. i have also found a cake to make so now I am all set! I love this idea. I think I may steal it for a moms group craft. Thanks...check out my blog I have a lot of tutorials also. That is really cute. I've never tried to make any felt sets or anything before - I'm kind of intimidated by them for some reason - but this one is so cute! This is very good, wow you are very talented at this. a great idea! my grandma love to make this kind of adorn, specially for the refrigerator and to decorate the kitchen, anyway I know that she gonna so happy when I tell her about this, thanks a lot. It's awesome blog post here. I have made it more then three times, so funny and beautiful. hope it's became more famous! I would love it if your sis could give us some patterns and a tutorial. 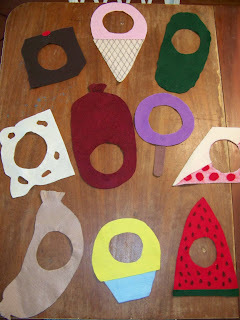 Such a great idea and I love to read Eric Carle to my kids in preschool. I love this so much! 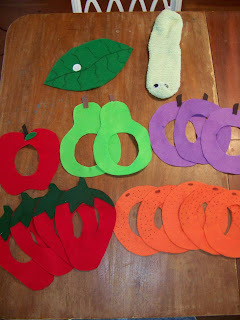 I am doing a hungry caterpillar round-up tomorrow & will be featuring your cute project. Do you have a pattern to make this. I would like to make several for my grandchildren. I just loved this book, myself and my grandchildren do to. I just brought all the felt needed to make this... I loved it... will be doing a theme on Caterpillars and butterflies soon with preschool... I'm sure they will love it as well.. thanks for the idea!!! I am a stay-at-home wife, mom, and homeschool teacher. I love Jesus and want to grow in his grace as I am on this adventure he has placed me in. This little blog is a creative outlet for me to share some of the things I make, find, and do. Thanks for stopping by! Other Blogs Worth Checking Out!